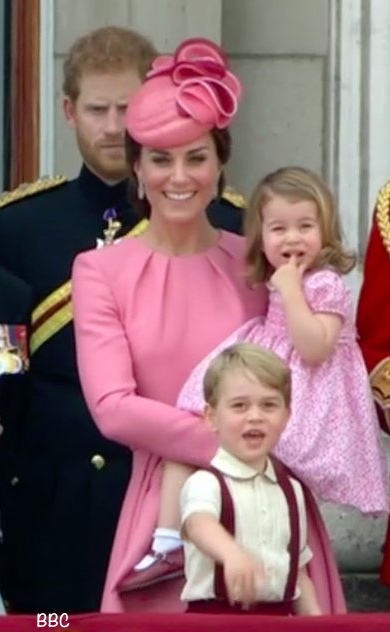 As anticipated, Princess Charlotte and Prince George were just darling at today’s Trooping the Colour events. HM and Prince Philip arriving at Buckingham Palace in advance of the RAF aircraft flyover. 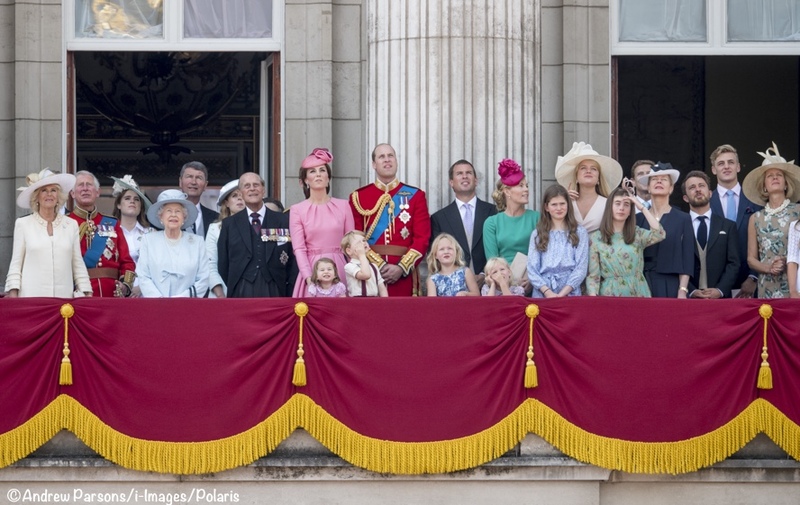 We could actually see the young royals before they went out on the iconic Buckingham Palace balcony. 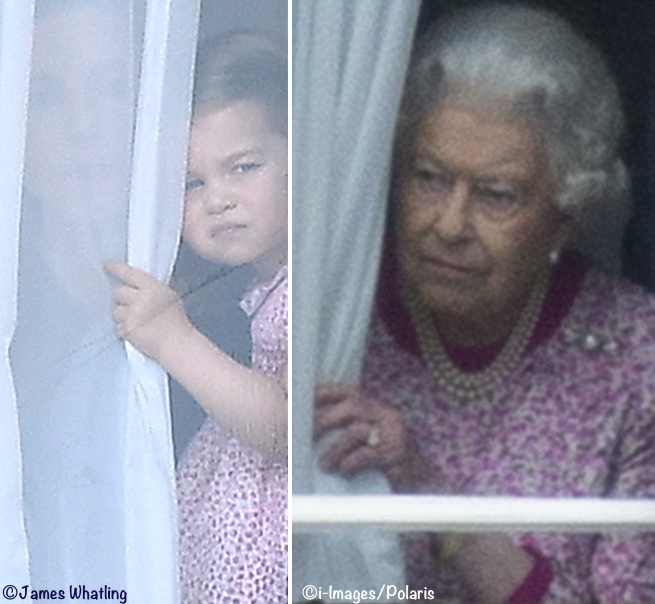 In fact, one of those photos showing the tiny royals at the window reminded us of another picture….so I had to put them side by side. The photo of the Queen peeking out the window is from last year’s Patron’s Lunch. 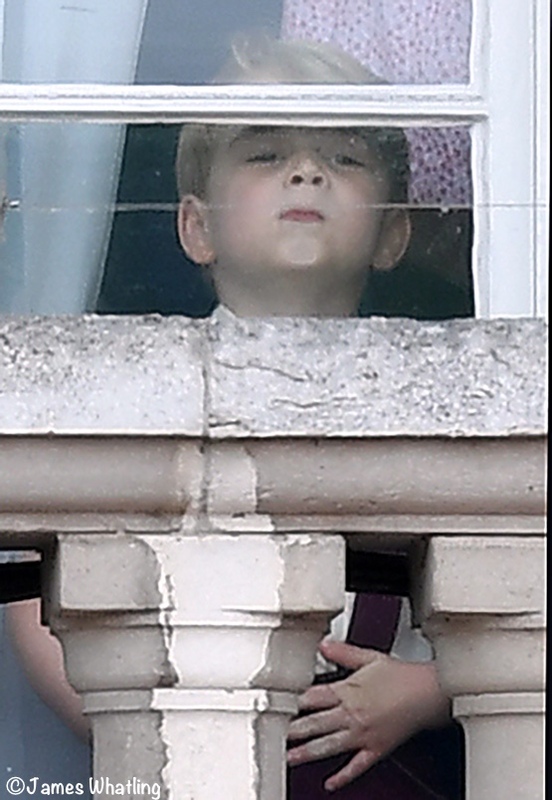 Below, Prince George getting a look at the goings-on with his nose smushed against the palace window. Then it was time to get out on the balcony and see the RAF in action. 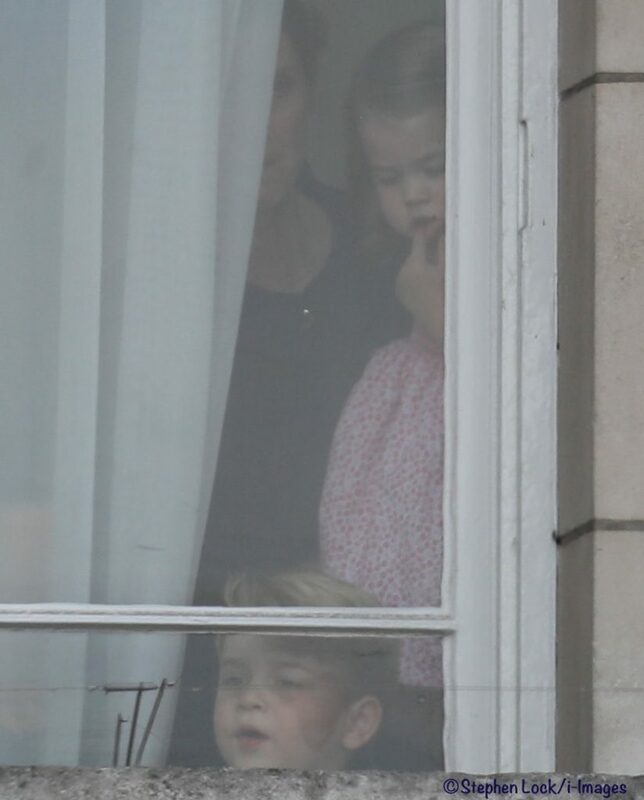 As the wider Royal family assembled on the balcony, Prince George and Princess Charlotte were spotted peeking at the crowds from behind a curtain, perhaps receiving a last-minute pep talk about their duties in public. 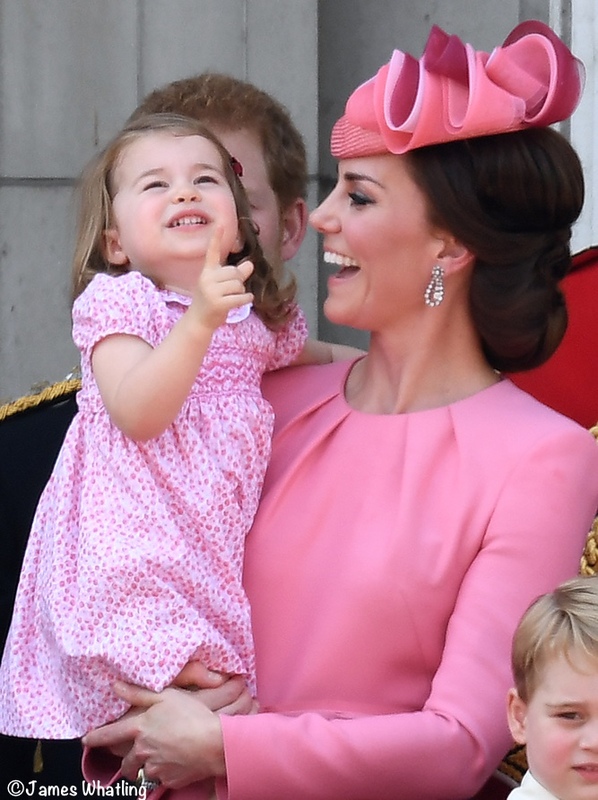 As the Queen and Duke of Edinburgh arrived, the two-year-old Princess was carried onto the balcony by her mother, the Duchess of Cambridge, wearing coordinating pink outfits and beaming at the waiting crowds. 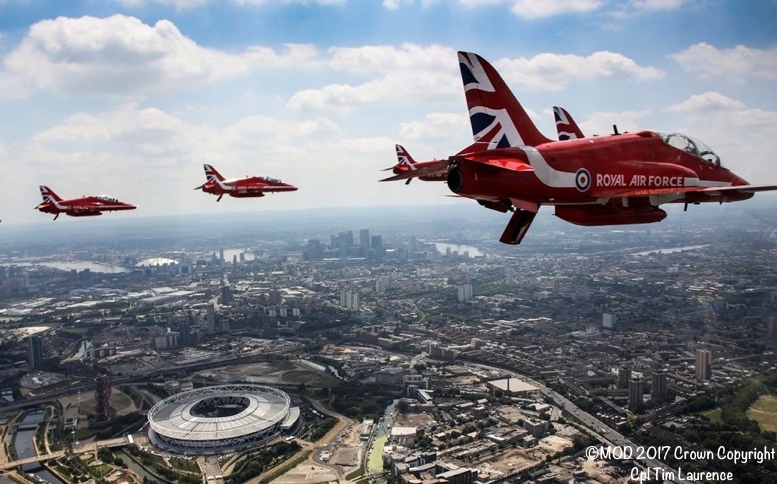 The Royal Air Force Red Arrows in action. 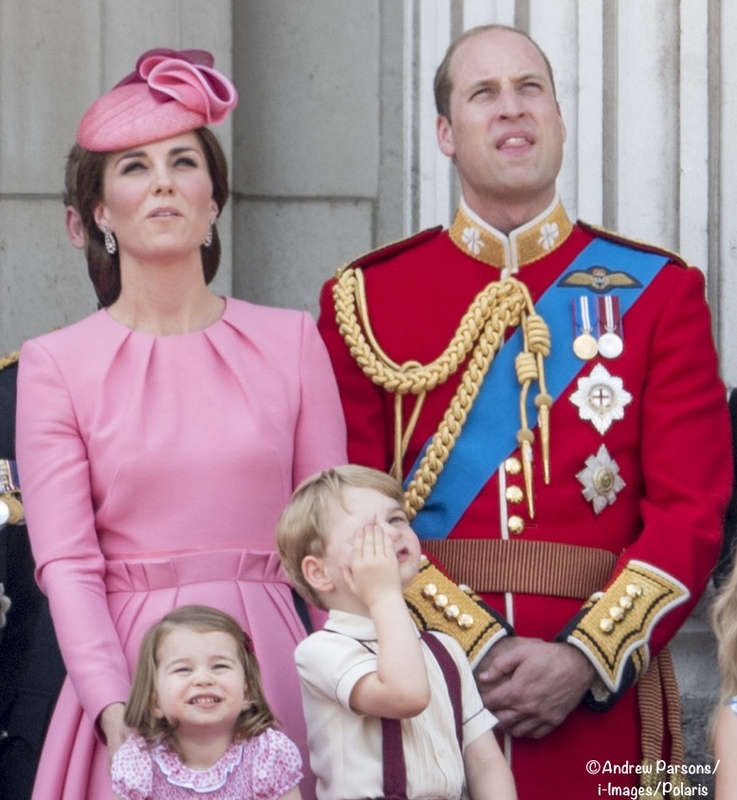 At the annual Trooping the Colour Event on Saturday, which acts as an official celebration of Queen Elizabeth’s birthday and an opportunity to wear the boldest hues in your royal closet, Prince George and Princess Charlotte did what they do best: stole the attention from absolutely everyone else. 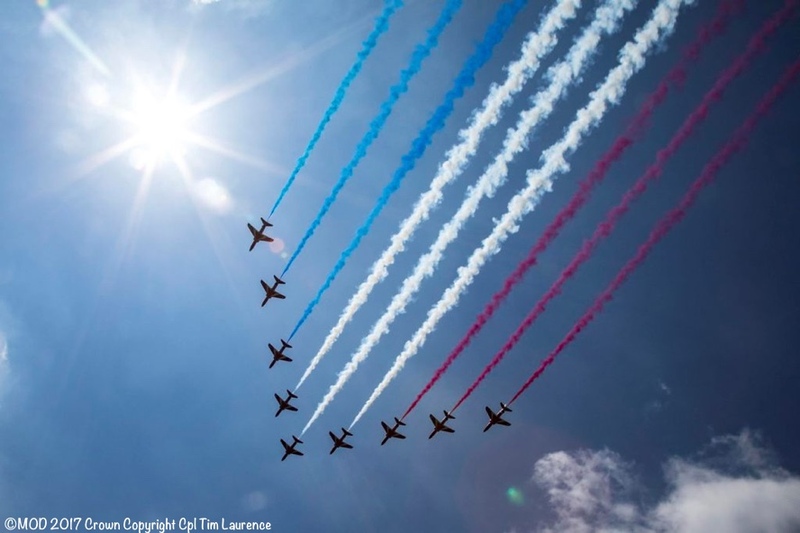 The RAF display was a gorgeous sight against the blue London skies. We’re not going to sugar-coat it: This has been a dismal week on both sides of the Atlantic, with two mass shootings here and a devastating fire over there (on the heels of three terrorist incidents in the last couple of months). 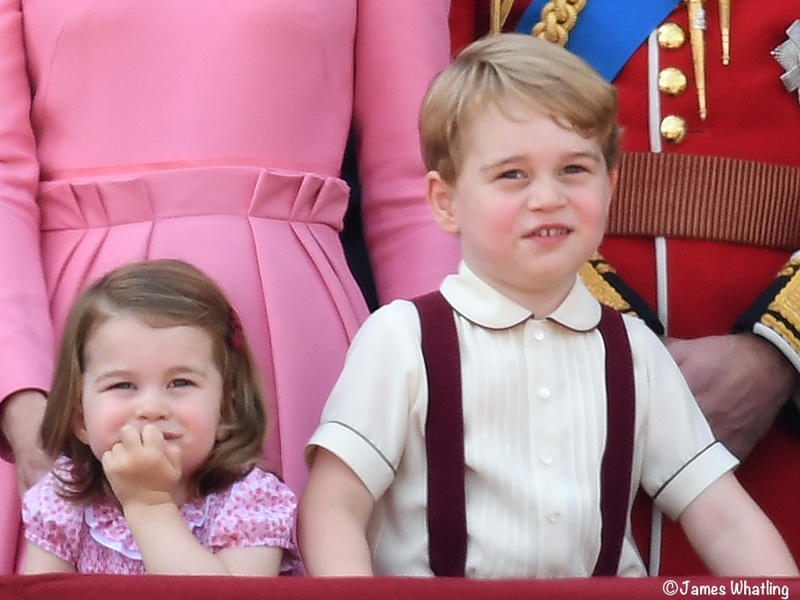 In other words, we needed a Prince George and Princess Charlotte sighting more than ever. 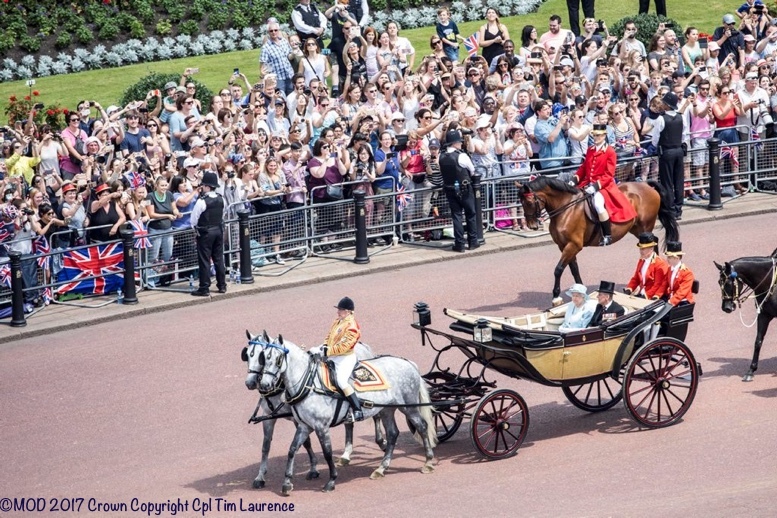 And conveniently, due to Saturday’s edition of the Trooping the Colour parade (marking the official observation of Queen Elizabeth II’s 91st birthday), we got one. George was in his element. 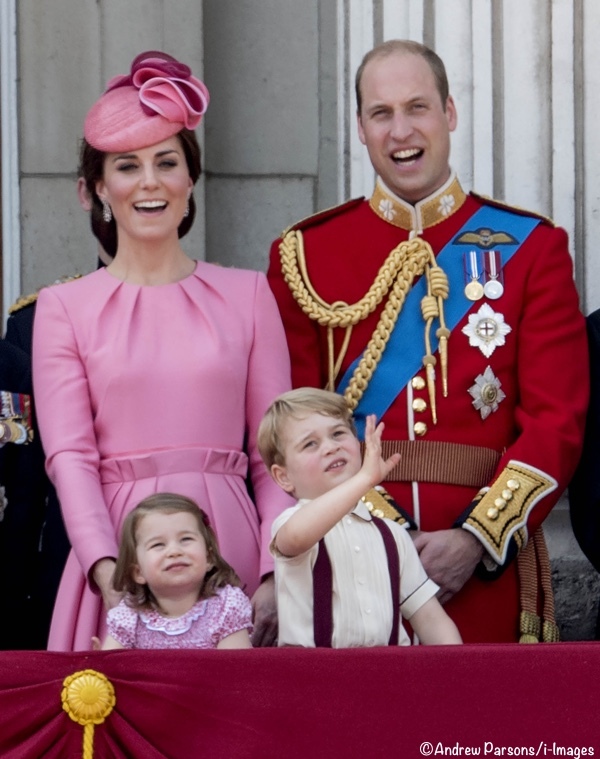 The Prince, who will turn four next month, and his sister Princess Charlotte appeared transfixed by the flypast, as they made their now-annual appearance on the palace balcony to wave to assembled Trooping the Colour crowds. 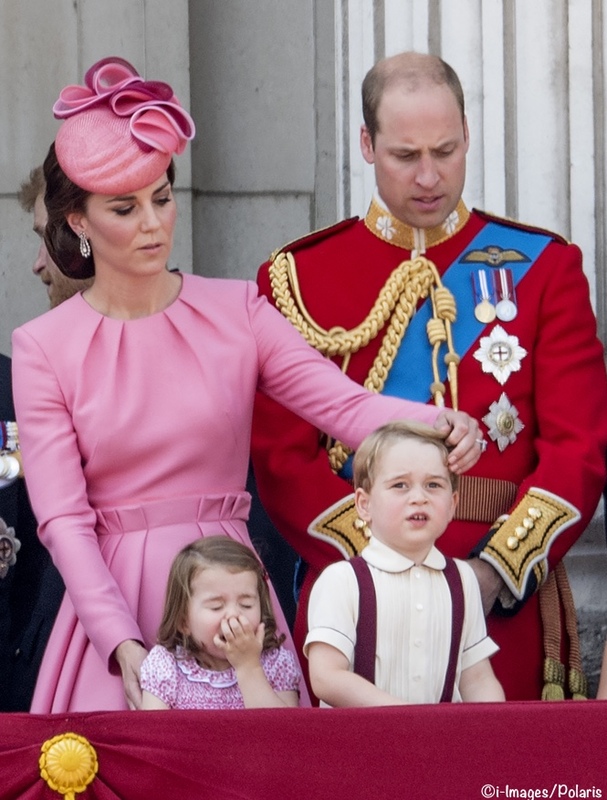 Both children looked like they were enjoying the spectacle, although they eventually grew tired. 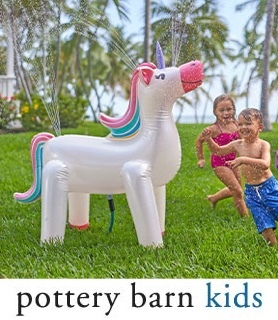 Even the most exciting things can become tedious if it’s hot and noisy and you’re a tired toddler. 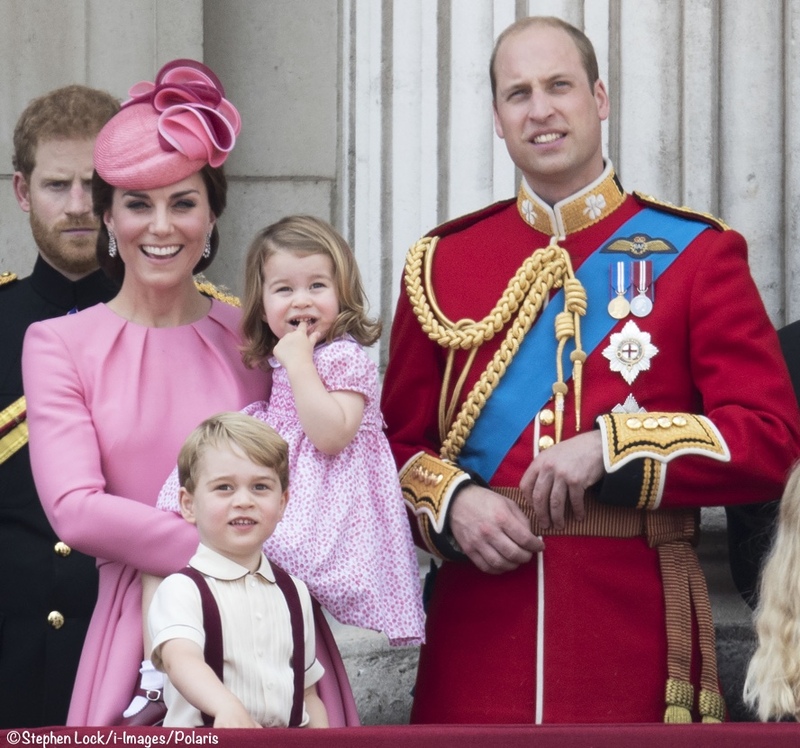 By sticking to a rather vibrant colour palette of red and pink, the Cambridge quartet stood out on the Buckingham Palace balcony amongst other members of the royal family. Charlotte was in another pink print dress. It featured a smocked bodice, ruffled collar, puffed sleeves and button back. There was not a sash or bow on the back from what we could see. I’ve not yet had time to look for the dress designer. The piece has all the hallmarks of a Spanish brand or seamstress, especially with the ruffle at the neckline. It’s *possible* Charlotte was wearing another pair of Condor’s Plain Sock with Cuff Detail; it is the style worn with her Mercedita shoes in Canada. I can’t tell if it is this style and they have sagged/bagged down a little, or if it’s a different pair altogether. We show the socks at Classical Child ($12 NZ, about $8 USD). 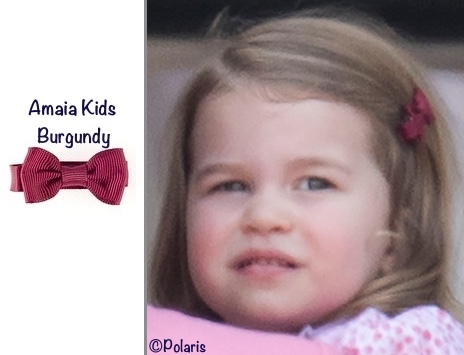 Charlotte wore one of her Amaia Kids hair bows, although it wasn’t visible in all of the photos. It could be her hair has grown so long the bows may not stay in place quite as well. 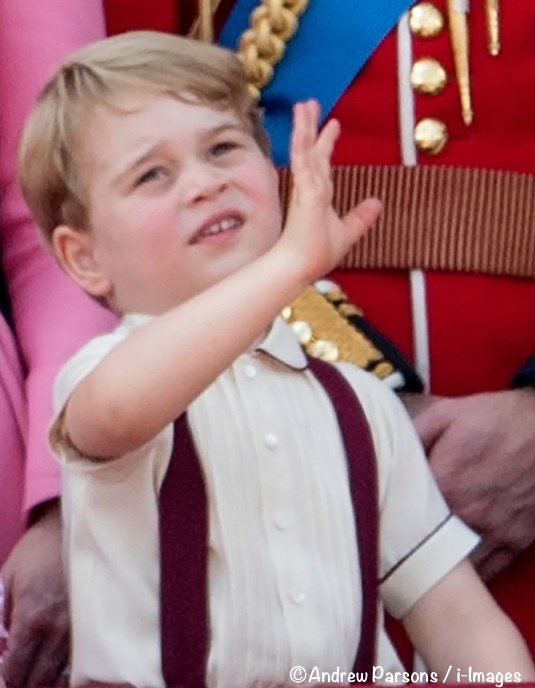 Prince George was in a pleated front shirt with a Peter Pan collar and tonal piping at the sleeve cuff and collar edge. 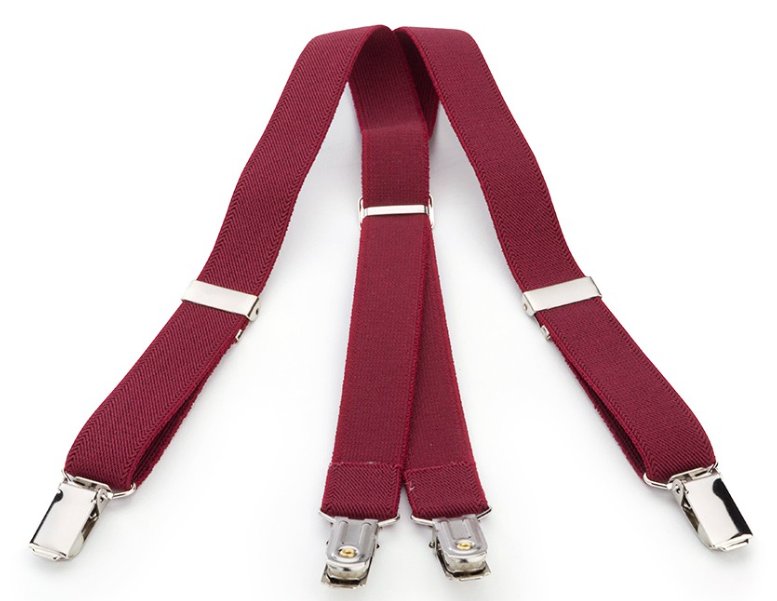 He also wore a pair of braces, similar to this style at Pisamonas. My guess is the Prince is in another pair of shorts; the color looks brown or burgundy from what little is visible photos. 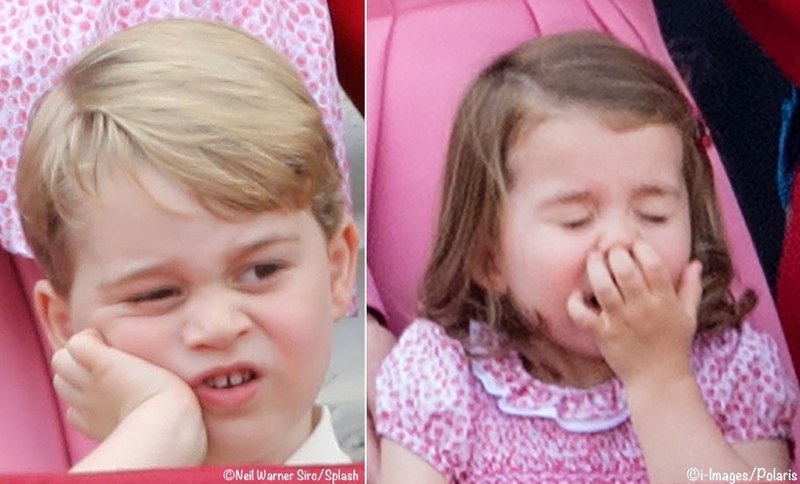 I’ve not had time to do any serious hunting for George’s short and braces, or Charlotte’s dress. There are a quite a few more photos I also need to add to the post. I’ll do all of this later tonight or tomorrow; we’re scooting out of town for a wedding. 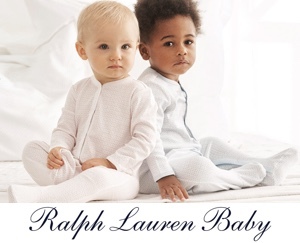 Upscale retailer Sue Hill offers pieces much like George’s, but they are for baby boys. We’ll leave you with this 2-minute video of the day’s events from The Telegraph and ITN. 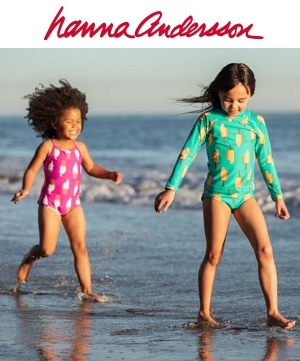 i have sewn for children’s clothes for years. These can easily be duplicated but they do look custom made. The designs all look Spanish to me. Perhaps the designer who made the knit bonnet she worn home from the hospital. All designers have signature looks. These are clothes worn everyday in Mobile, Al. They were so popular 40 years ago and repeat in popularity with every generation. French hand sewn clothes are still very popular in Mobile and the South. Almost everyone I know has a oil portrait or beautiful baby pictures in classic clothes. 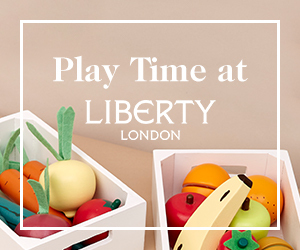 Fine fabrics as Swiss batiste and Swiss lawns, Liberty prints and fine baby corduroy are all still available here. What a beautiful heritage we have. Thank you for showing how children should still look like children and not small adults. 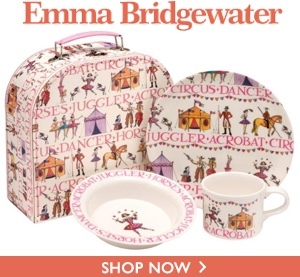 I think Kate does Princess Charlotte’s dresses in an atelier or from when she was little. We never find normal models in similar stores! 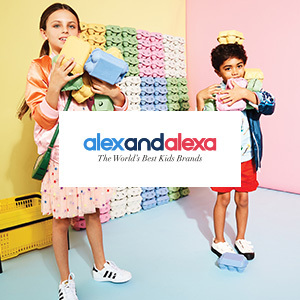 When I was not yet a duchess, she wanted to open a children’s clothing store, if I’m not mistaken, she should be entertaining with the children. 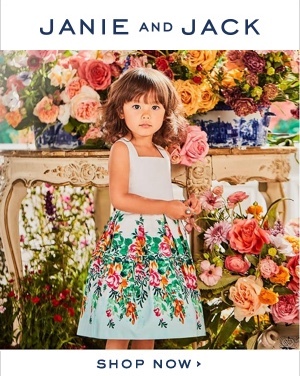 I wonder if Kate would’ve still been inclined towards Spanish children’s clothing brands if her nanny wasn’t Maria Borrallo. Pepa & Co and Doña Carmen, are solid favorites with the Duchess, and with reports that at least some of the clothing are bought directly from the stores in Spain, I can’t help but think that nanny Maria is a heavy influence on the choices. 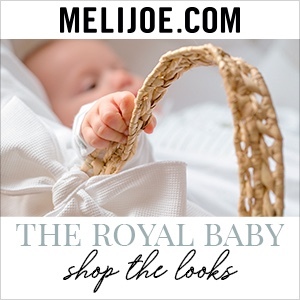 The Spanish children’s clothing industry must be thankful for her employment as the royal nanny! And Charlotte has another gorgeous smock dress – perversely I have no problem with this particular piece of vintage. Not so sure about her longer hair, I stick to an old belief that a little girl’s hair needs to be cut short to start with so it might grow thicker should she choose later. I feel sorry for Harper Beckham in this respect as I fear she may be landed with rats-tails for life. Also not sure longer hair with waves quite suits Charlotte who has quite a square face. Obvs none of this prevents her being the sweetest scene-stealer! Thanks for putting up such great pictures and information so quickly. 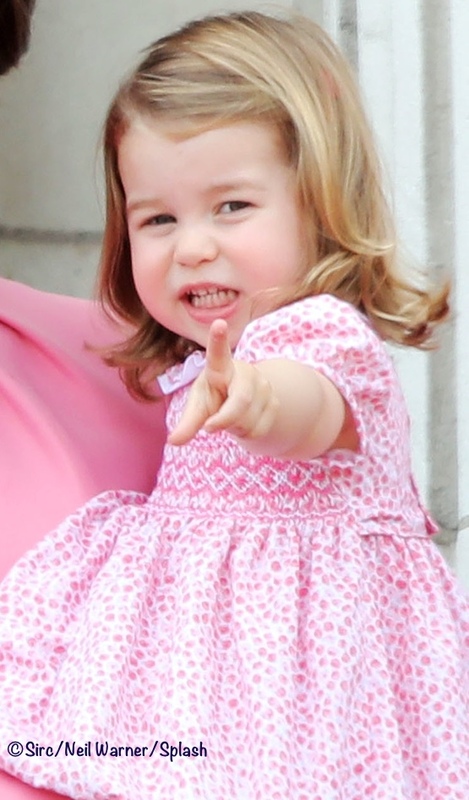 I absolutely loved the match up pictures of Charlotte and Her Majesty! It is now the screensaver on my phone and laptop. Genetics are amazing! 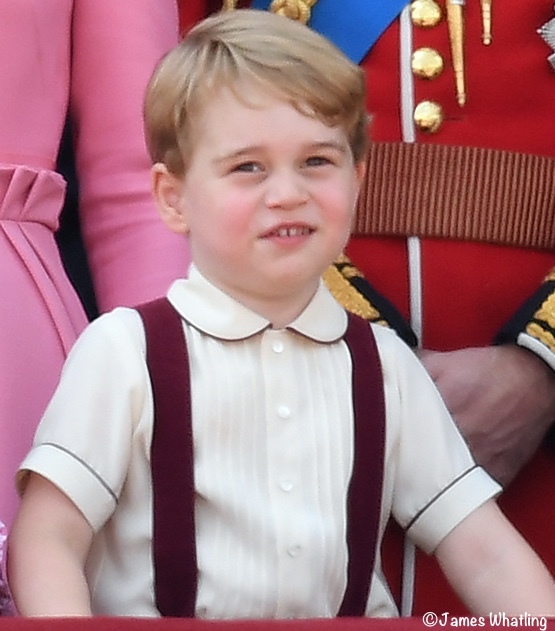 I wonder if today’s outfit is what George wore under his navy sweater in the portrait of HM with her great-grandchildren and two youngest grandchildren…or the same thing in a larger size. Another excellent article! Thank you. Those children get more adorable every time we see them.